For quite some time now, I’ve known about the merits of checking your mixes in mono to test for phase problems, and having some “grot boxes” (cheap, lo-fi speakers) to see what your mix will sound like on a less-than-stellar playback system. 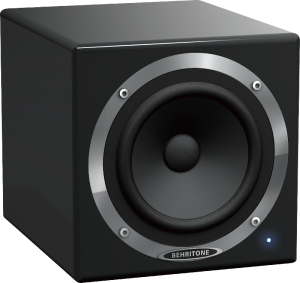 The idea behind the mono grot box is this: who cares if your mix sounds great on your studio monitors if it sounds like garbage on most listeners’ playback systems? I followed the logic, but was never really compelled to invest in a grot box or mono monitoring solution until reading the book “Mixing Secrets for the Small Studio” (highly recommended reading) by Mike Senior from Sound On Sound magazine. For the reasons stated above, one of the book’s earliest recommendations is to get your hands on an Auratone or Auratone subtitute. The Auratone was a cheap little cube-shaped speaker with a 5″ driver that recording studios began using back in the 70’s as a reference standard for other cheap speakers–like those you might typically find in boom boxes, TV’s, and the dashboard of your Ford Pinto. The Auratone’s design also had some other benefits in that it’s unported, which avoids any problems typically associated with resonant porting frequencies, and it’s a single full range speaker (instead of a woofer + tweeter combination), so there’s no crossover, which can create some negative sonic artifacts of its own. When I originally published this article, Auratones had been out of production for many years (they’re now back in production with the 5C), but there were several other companies making similar alternatives, including the Avantone MixCube, the Triple P Pyramid, and the Fostex 6301. I looked into all three of these models, but all were more expensive than what I could justify at the time. 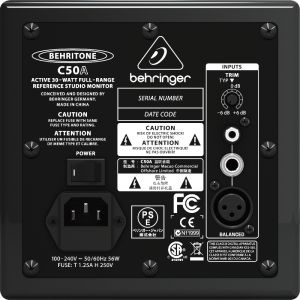 Shortly thereafter, I saw that Behringer was releasing it’s own Auratone substitutes in the Behritone C5A and Behritone C50A. Behringer is known for delivering solid gear for a fraction of the price of its nearest competitor, and the Behritone looked to be no exception. I chose the C50A rather than the C5A, mostly because it has a wider frequency response of 90 Hz to 17 kHz vs. the C5A’s response of 150 Hz to 15 kHz. In this regard, the C50A is actually more of an “Avantone Mixcube clone” than an “Auratone clone”. So in a sense, the C50A is a “clone-of-a-clone”. The C5A, on the other hand, not only has more of a “vintage vibe” in its woodgrain appearance, but its frequency response more closely resembles that of the original Auratone. The C50A is an active/powered speaker, with a 30-watt class D amp built into the cabinet. It’s quite heavy and solid for its small size. It has an attractive glossy piano-black finish and no controls on the front–only a power/peak indicator light that normally glows blue, and changes to a purple color when powering on, or if the input is clipped. The back panel has a power on/off switch, standard IEC connector for the included power cord, and three sets of inputs: balanced XLR, balanced 1/4″ TRS, and an unbalanced RCA. There’s also an input trim control with a range from -6 to +6 dB. The bottom of the cabinet has a neoprene rubber pad pre-installed to help de-couple the speaker if placing it on a desk or table. It also has a handy threaded insert in the bottom for mounting the speaker on top of a mic stand, similar to what you see with the compact “hot-spot” style stage monitors. Since the purpose of a grot box is not to sound great, this speaker does its job well! It sounds like a typical full-range speaker of its size that you would commonly find in a portable radio, television, dashboard, or computer speaker. Even though it doesn’t deliver a “hi-fi” sound, it has a certain vintage charm to it that’s reminiscent of those days of crusing in the car and listening to your favorite songs on the radio. So it’s in no way unpleasant to listen to. In use, I’m finding that the C50A helps to uncover potential problems in my mixes that I might not normally detect over my main stereo monitors. Specifically, it’s helping me to make more informed decisions about EQ, helping me to watch out for problems with phase cancellation, and letting me know what my mix will sound like for a typical listener. It also provides a nice “reset” for tired ears if you’re in the midst of a long mixing session, and simply need a break from your larger monitors. 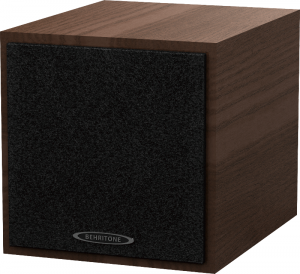 All-in-all I think the Behritone is a small, but smart investment for a studio of any size that’s looking for another inexpensive way to improve your mixes. Update: As of this writing, the Behritone C50A and C5A both appear to have been discontinued. If you’re still interested in a speaker for checking your mixes in mono, we now recommend the Avantone MixCube–an active/powered speaker upon which the Behritone C50A was based, or the Auratone 5C–the passive speaker upon which the (active) Behritone C5 was based.